Trudel and Sons Roofing: Battling a Leaky Roof? You May Need Flashing Repairs! Battling a Leaky Roof? You May Need Flashing Repairs! Leaky roofs are often tricky to diagnose. At best, they’re a nuisance—and at worst, a costly structural nightmare. There are many reasons for roof leaks, and flashing damage is near the top of the list if you’ve ruled out shingles, valleys and ice damming. Metal flashing is often made of tin-coated steel, galvanized steel and copper, and is the material used to “bridge the gap” between roofing materials and non-roofing materials. For example, flashing is found between roof planes, around chimneys, at the termination of roof slopes, around skylights and in roof valleys. When properly installed, flashing will prevent water from seeping in to your home at the base of chimneys and vent pipes, in roof valley areas, or around exposed windows. To prevent expensive flashing leaks, make sure you install the appropriate amount and type of flashing. It’s also important to inspect flashing 1 to 2 times a year. Below, you’ll find additional maintenance recommendations. 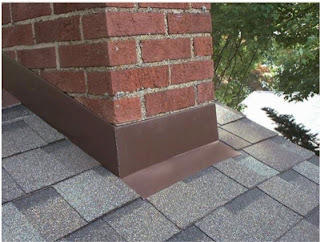 While inspecting your roof shingles and gutters, look for loose nails, fasteners and seals at your shingle edges, around the chimney and in sloped areas where flashing has been applied. As the caulking and silicon sealant applied to the flashing ages and is exposed to weather, it may crack, crumble or pull away. Flashing may simply need to be tacked down or resealed. If you recognize loose flashing, don’t allow it to go unrepaired. Water can literally stream down into your home through improperly sealed joints. To help new or existing flashing last longer and withstand the elements, prime flashing with a metal primer and seal it with corrosion-proof metal paint that matches your home’s roofing material. This will help to prevent damage due to rust, and will lengthen the life of your roof flashing. Seal improperly covered seams with urethane roofing cement. This type of sealant is designed to be applied between flashing and shingles or siding to prevent seepage. Remember, if you see a lot of dry, crumbling caulk at the seam, scrape it away with a wire brush before applying a new sealant layer. Remember that while there are many do-it-yourself ways to maintain the integrity of your flashing, severe flashing damage or home leaks are best left to an experienced roof repair specialist. If repairing your leaky roof seems overwhelming, contact Trudel and Sons Roofing, a family-owned & operated Stoufville-based roofing contractor in business since for more than 30 years! Whether your roof needs an inspection, a little patchwork or an overhaul, our insured and licensed professionals are trained to get the job done right—and our work is always guaranteed! Call (905)642-3515 or visit www.trudelandsons.com to schedule your inspection today!